Jonah’s Hill is a wind-weathered island somewhere in the Gulf of Finland, just slightly on the other side of the known world. There, on a remote sandy cove, live Inkeri, Johannes and an eclectic gang of kooky characters, each stranger than the next. On this island, friendships are lifelong, animals are eloquent, machines are mysterious, books are ancient, cider is dry, cherry jam is sweet and all of life is pleasantly unhurried. But then, as August turns to autumn, the earth surges, opening up a maze of puzzles so deep that the people of Jonah’s hill must sail to the end of the world and beyond in order to solve it. Conceptions of camaraderie undergo shifts large and small when a group of people finds itself thrown into extraordinary circumstances. A mesmerizing lexical stream carries readers through this ambiguous terrain and into ruminations on the relationship between truth and tale. Who are we to ourselves, in the end? The Whales of Jonah’s Hill includes talking animals, scientific history, suspense, friendship, nights around the campfire, cold-blooded villains, mysterious machines and the exploration of life’s little mysteries.is a poetically old-timey adventure story, in which everyday human life and astonishment blend together seamlessly. 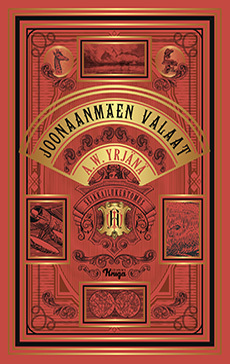 The world created by A. W. Yrjänä is like a concoction cooked up by Tove Jansson and Jules Verne. It is profoundly humane and a bit bizarre, quite whimsical and even a little frightening at times.